Mazak Memory for 500 Series Controls & M Plus or T Plus Controls. 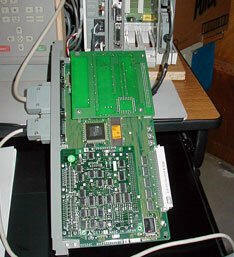 New 2 MB Memory upgrade for Mitsubishi CNC's Controls. Increases feed rates and eliminate interrupted feeding and hesitation tool marks. Complete instructions allow "end-user" installation. Competitive pricing that makes this upgrade accessible to all users! Save over OEM costs. Phone 903-387-7379 for details on this new product available now. These have our standard 3 year warranty and can be user installed with the instructions supplied. To Save $$$ on other CNC Parts and Equipment.